Ashley Deary leaps for a shot over the defender. The junior guard was an assist away from a triple-double in Thursday’s win over Minnesota. INDIANAPOLIS — Survive and advance. 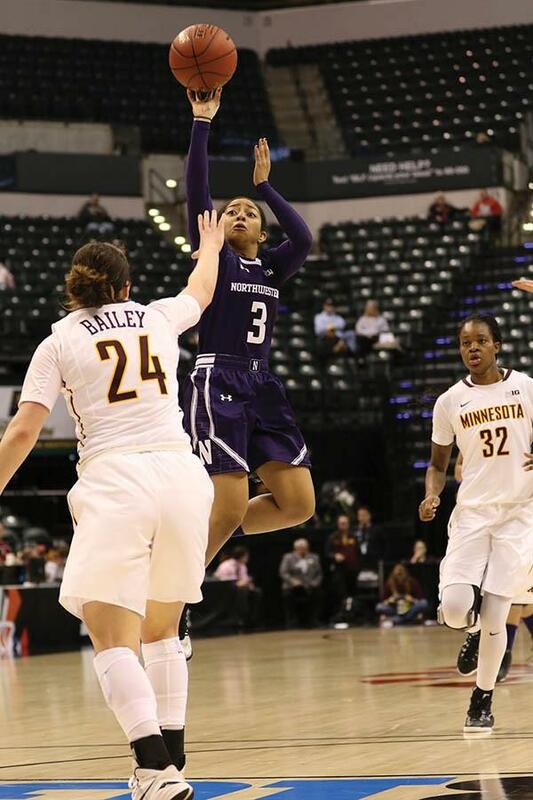 With senior guard Maggie Lyon out for the second straight game, Northwestern’s three star juniors carried the the Wildcats (17-15, 4-14 Big Ten) to an 84-74 victory over Minnesota (19-11, 11-7) in the second round of the Big Ten Tournament on Thursday. Forward Nia Coffey recorded a double-double with 25 points and 12 rebounds, as did guard Ashley Deary with 12 points, 10 rebounds and nine assists, and guard Christen Inman added 18 points for NU. It was Coffey that put the team on her back in the fourth quarter. She scored NU’s first 9 points of the quarter to turn a 1-point lead into a 9-point lead. After the game, McKeown said he’s glad Coffey is on his team. “In March, when you have a player like that, you’ve just got to rely on her and just let her do her thing and give her some freedom to…make decisions in the open court,” McKeown said. Then, with the Cats up by just 4, freshman forward Pallas Kunaiyi-Akpanah won the game for NU. Kunaiyi-Akpanah grabbed offensive rebounds on back-to-back missed shots and knocked down two free throws with just more than a minute remaining to give the Cats a lead they wouldn’t relinquish. see her jump up and get the ball,” Coffey said. Big Ten Player of the Year Rachel Banham scored 26 points for Minnesota and guard Carlie Wagner added 18. NU almost entirely neutralized Banham and the Gophers’ offense in the first quarter. After making a 3-pointer on her first shot attempt, Banham missed her next four shots in the period. With Coffey and Inman leading the way, the Cats led 21-11 after the first 10 minutes. For the second straight game, freshman guard Jordan Hankins provided a jolt of energy off of the bench, finishing with a career-high 14 points. Hankins knocked down two 3s late in the first quarter, including one from well beyond the arc with 10 seconds on the clock, and helped put the game away late with free throws. As it often does, foul trouble became an issue for the Cats in the first half. Kunaiyi-Akpanah started the game strong with 6 points and five rebounds in the first 15 minutes, but was whistled for her third foul in the middle of the second quarter and was forced to sit out the final 6 minutes of the half. Unsurprisingly, Banham started to heat up in the second quarter, scoring 9 points in the period as Minnesota came back and tied the score. However, she picked up her second foul on a reach-in late in the quarter and with her on the bench, NU used a late run to take a 39-35 advantage into halftime. After knocking down eight 3-pointers in Wednesday’s win over Wisconsin, the Cats approached that total in the first half alone on Thursday. NU shot 6-of-13 from beyond the arc in the first half, which was a major reason why it led at the break. Deary said the team’s success from deep was due to passing as much as knocking down shots. The hot shooting didn’t stop in the second half. NU knocked down its first three looks from long range in the third quarter to restore a comfortable cushion. In Wednesday’s victory, several seldom-used players stepped up and made key plays in the absence of Lyon and Thursday it was junior forward Allie Tuttle’s turn. When Kunaiyi-Akpanah picked up her fourth foul early in the third, Tuttle came in and played valuable minutes down low, scoring 4 points and grabbing six rebounds. Tuttle played 7 minutes on Wednesday and didn’t score. On Friday, the Cats will return to the court when they take on fourth-seeded Indiana in the tournament quarterfinals.